Working out is no longer just about working out your physical frame and building muscle. Many recent studies are now focused on how exercise boosts brain function regardless of age or level of fitness. Studies prove that making time for exercise (treating it as a priority) provides some serious mental benefit’s such as an increase and boost in mood and lowered rates of depression. 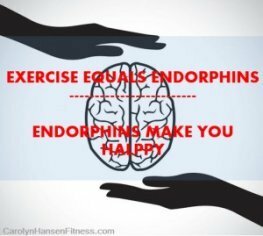 Not surprising, the reason has everything to do with hormones…when you exercise, your body rewards you by releasing chemicals/hormones called endorphin’s. They are released and manufactured in your spinal cord, brain and other parts of your body in response to neurotransmitters (brain chemicals). Endorphin’s also act as analgesics and sedatives. Their job is to diminish the perception of pain. These “feel good” endorphin’s trigger positive feelings throughout your body that are similar to morphine except unlike morphine, the activation of these receptors by the body’s endorphin’s does not lead to dependence and addiction. It truly is your “natural high.” It’s free, totally non-invasive and readily available to those who turn on the flood gates by performing relatively intense exercise because relatively intense exercise has been proven to be one of the easiest ways to get the body to release massive doses of “feel good” endorphins into the system. Often known as “runner’s high,” (because of the “high” that runners feel) it is a boost in positive feelings that energizes the body, lifts your mood and shifts your outlook on life. Truth is, exercise…especially challenging exercise and muscle building is the real “fountain of youth.” It is the only thing that stimulates both physical and mental health and you cannot experience true health and vitality without the dance of both. Happy hormones: Nothing better to boost those “happy hormones” and lift depression and anxiety than exercise. You don’t have to be a gym rat to benefit. It only takes around 30 minutes a few times weekly to get your “happy buzz” and boost your overall mood. Raises self-confidence: Physical fitness boost self-esteem and improves self-image regardless of age, weight, size or gender. Exercise quickly elevates a person’s perception of his or her attractiveness…of their own self-worth. Supports brain health: Exercise and diet can help shore up the brain against cognitive decline that generally begins after age 45. Working out boosts chemicals in the brain that in turn support and prevent degeneration of the hippocampus, important for memory and learning. Calming effect: Exercise is the perfect remedy for anxiety because the chemicals released during and after exercising help calm anxieties down. Studies indicate that any form of exercise can help and doctors and therapists turn to regular challenging exercise as the first defense against depression. All types of resistance and strength training exercise are ideal. But, playing tennis, swimming, fast-paced walking, strenuous yard work, jogging moderately, gardening, dancing and biking are all great exercises that can be performed when the weather permits and joining your exercise with fresh air will give you an even bigger boost in spirit as there is something truly special about the grandeur of nature, breathing fresh air and physical movement that makes the experience all the more “euphoric” in nature. Exercise is your perfect “pick-me-upper, it literally “kills two birds with one stone”…both your physical and your mental health improve.